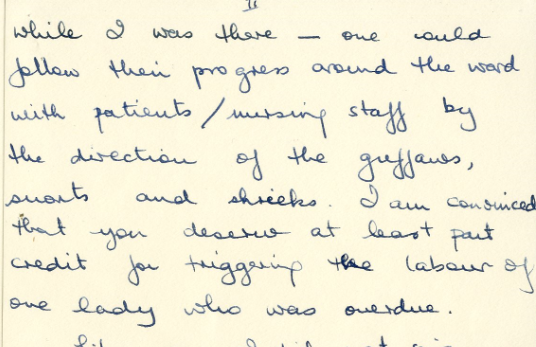 Guest Post from Helen Ward, Library Assistant in Archives and Special Collections. 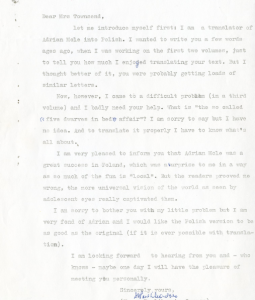 To aid researchers, I have been adding details to our catalogue describing the content of individual letters from the correspondence series (reference: ST/16/5) within the Sue Townsend Collection. I have found many of these letters to be charming and worthy of being shared with a wider audience via this blog. 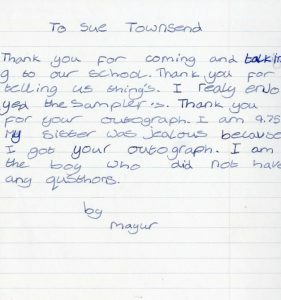 There are three folders of letters received by Sue Townsend from school children (ST/16/5/3), mostly written between 1992 and 1996. 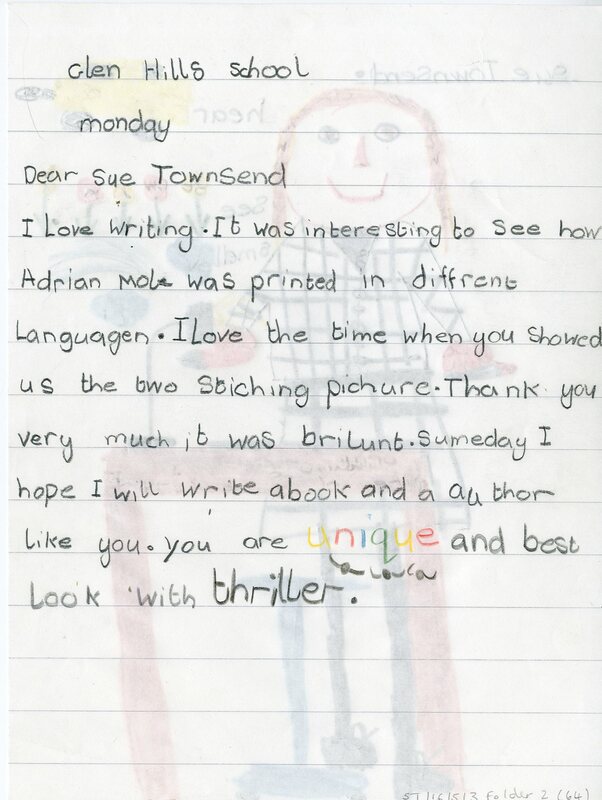 These include letters thanking Sue Townsend for school visits, seeking information for a school project or requesting autographs, along with general fan mail. 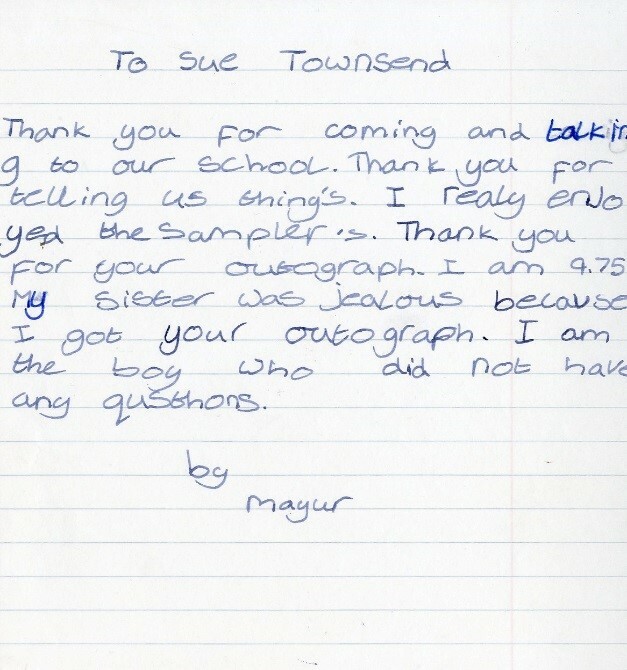 The correspondence thanking Sue Townsend for a school visit comes mainly from pupils at Glen Hills Primary School, the school Sue herself attended, after her sessions there in March 1996. 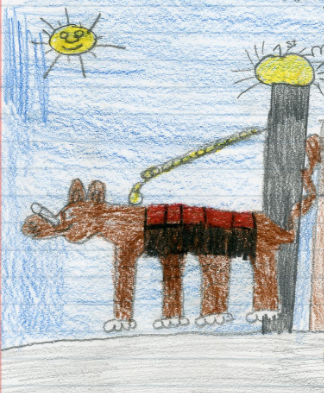 These letters, which give an insight into the content and structure of the school visits, were striking because of the pupils’ evident enjoyment of the visit and provide glimpses into the pupils’ personalities. 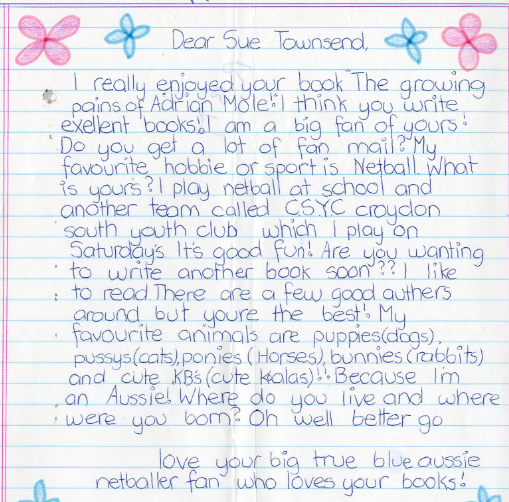 Among the fan mail are several chatty letters telling Sue Townsend about hobbies, pets, school and home life. 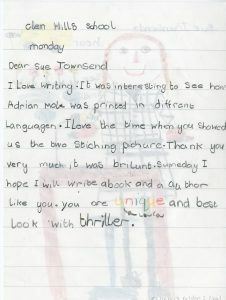 Others discuss the content and ideas within their favourite Sue Townsend novels. 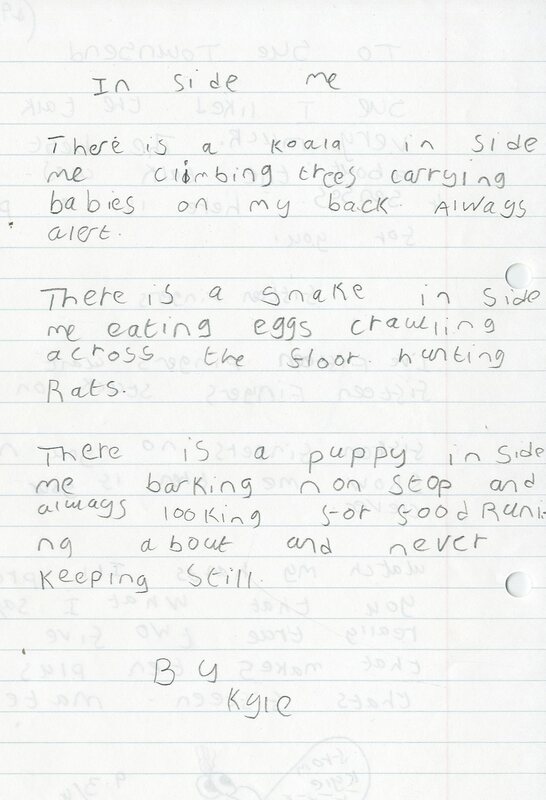 For example, a fan writing from Wales in December 1993 identifies with the critical thinking about the monarchy they perceive in the novel ‘The Queen and I’. The teenager considered writing to the Queen to recommend reading the novel but was dissuaded by their parents who feared they would be put on a political blacklist. 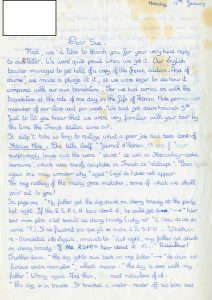 A further folder, ‘Fan mail received from overseas readers’ (ST/16/5/7), contains 71 letters from 15 different countries written between 1983 and 2001, with the majority written in the 1980s or 1990s. Some similar themes arise in these letters, notably congratulating Sue on her writing (on occasion even press articles) and expressing affinity with the characters or ideas within them. 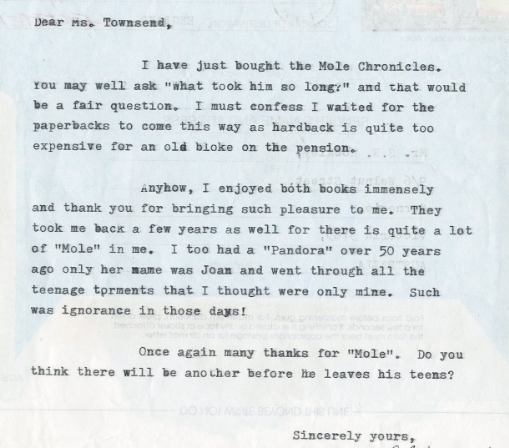 ST/16/5/7 Folder 1 (9) Fan mail from an Australian pensioner congratulating Sue Townsend on the ‘Mole Chronicles’. The fan comments he had his own ‘Pandora’, named Joan, over 50 years ago. 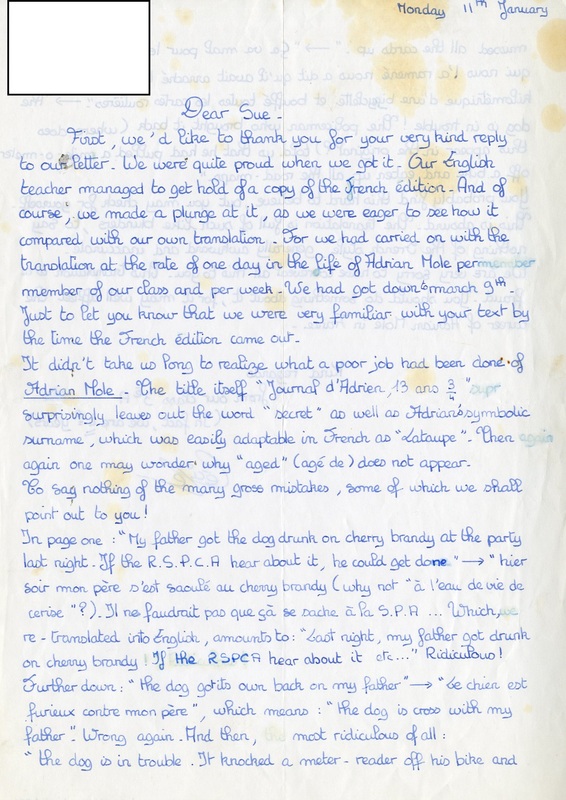 ST/16/5/7 Folder 1 (55) First page of a letter received from a French school pupil thanking Sue Townsend for replying to the class letter. 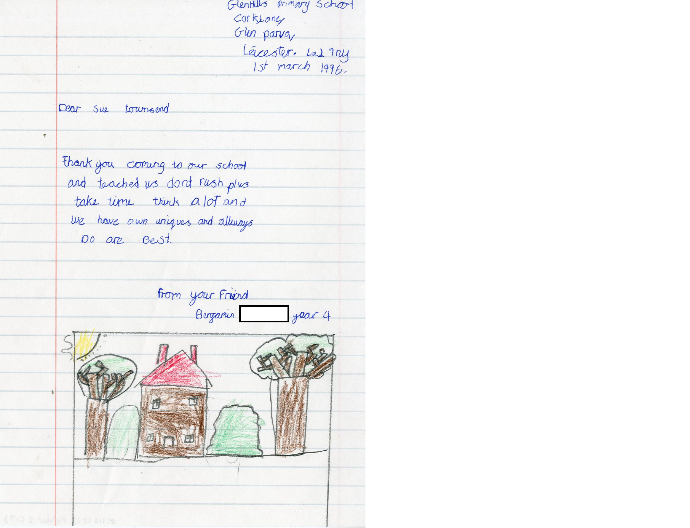 The fan’s class are translating an English language edition of ‘The Secret Diary of Adrian Mole’ into French. The class have also seen a French translation and the fan brings some ‘blunders’ in the translated version to Sue’s attention. 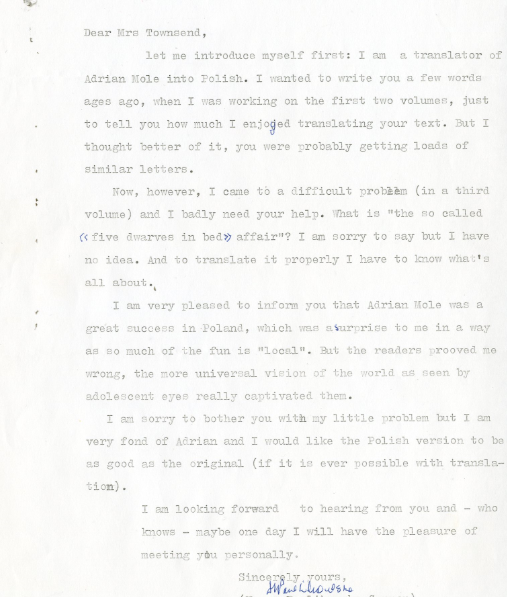 Even when language is shared cultural differences can still cause confusion, as this letter from an American fan, writing from New York in April 1987, shows. There are too many engaging letters to mention and no doubt more to discover as the detailed cataloguing of the other folders in the correspondence series continues. I finish with one of my favourites: a letter from an Australian fan, thanking Sue Townsend for some enjoyable reading whilst confined with high blood pressure prior to the birth of her baby. The fan shared her copy of the ‘Mole Chronicles’ with others on the ward and comments it may have helped trigger another patient’s overdue labour. 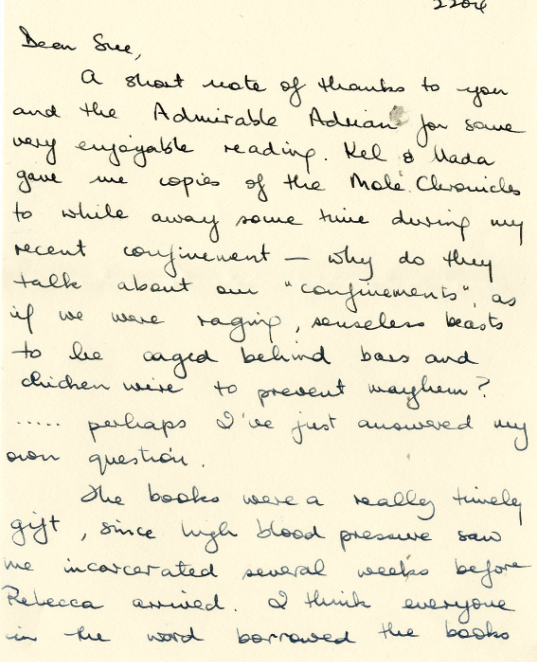 To read more of Sue Townsend’s fan mail why not visit Archives & Special Collections? Staff, students and the general public are welcome to view the Sue Townsend Collection held in the University Library. Viewings are arranged on an appointment system, so please email specialcollections@le.ac.uk to request items from the archive and to arrange an appointment.